It happens to all of us at one point or another. It doesn’t matter if you have the muscles and strength of LeBron James or the speed and soccer skills of Lionel Messi. Sometimes there is just no avoiding it: we all suffer from a sport’s injury at some point in our lives. A running injury does not have to be a death sentence to your cardiovascular fitness, there are alternatives to keep you going while your body is healing, whether you have a twisted ankle, plantar fasciitis, or a much too common stress fracture. Do not despair; relative rest can actually be a good thing! I love my swim training for triathlon! Michael Phelps would certainly agree, swimming is an excellent, low-impact alternative to running. As the water supports your body, your joints do not experience the same level of stress and impact they do during a run. There’s no doubt that swimming is a strenuous sport, allowing you to increase your endurance and reach your cardio fitness level just as easily as running. Besides working out, water is also frequently used for rehabilitation purposes, such as kicking your knees back and forth to build strength and increase range of motion after a knee injury or writing the alphabet with your foot to help the healing process of an ankle sprain. If you are someone who often struggles with shin splints, incorporating a swim into your training regime can help to eliminate this problem. Moreover, swimming is a total and complete body exercise, working everything from your arms and abs, down to your heels and toes. And who knows, you may even decide to try a triathlon! 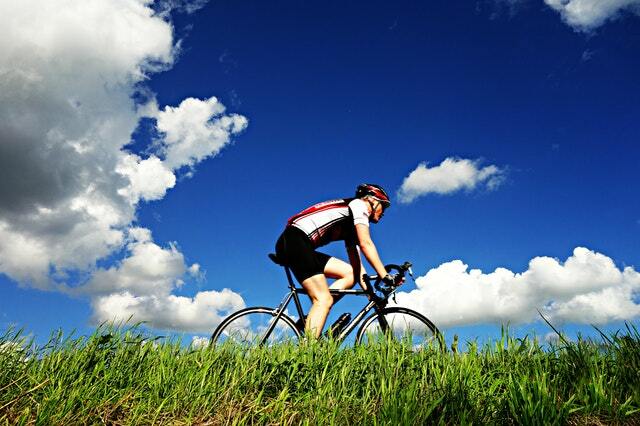 If you are more of a land mammal than a dolphin, biking can be another substitute for running. A stationary bike is a great start following an injury as it enables you to adjust the resistance you’re pedaling against to minimize your pain. As you heal, you can increase the resistance and adjust your speed accordingly, or even switch over to a road bike. Similar to swimming, biking reduces the amount of stress on your joints when compared to running, but can still be used to burn calories and boost your endurance. When swimming and biking can’t satisfyingly scratch your itch to run, why not try something completely different? It might not be the first thing you think after an injury, however yoga could be another new and unique alternative to running. And yoga is not just for girls! Some of the best yogi I know are guys who run with us at the Lake Grapevine Runners and Walkers Club! Yoga exercises work to stretch and extend every aspect of your body, including your skin, muscles, tendons and ligaments. All the varying yoga postures will increase the flexibility of your body and ultimately help you to avoid future muscle tears and injuries. Yoga can be utilized as a way to build strength as well. Such stances as the upward dog and downward dog require you to support your body weight with your arms. These postures are then out held for a period of time, compelling the use of your muscles to maintain your balance. The benefits of yoga will not only help you avoid injuries in the future, but will help to perfect your overall running form through improved posture. It is important to keep in mind that some yoga poses will actually irritate your injury, so keep that in mind while you venture into the yogi world. Last, but never least; you can try circuit weight training. This is combining 3 or 4 different push, pull combinations with light weight training that will increase your heart rate and increase your muscle metabolism at the same time. This is great off-season training and recovery training. Think about it, burn fat and build muscle. What could be bad about that? You may even get some decent looking shoulders, abs, and back out of it as well! When you do find yourself suffering from an annoying injury, it can be difficult to accept the fact that you cannot and should not run. Furthermore, that runner’s high, the natural endorphins our bodies create when we run for long distances, can allow us to easily ignore even our most excruciating pains. As addictive as the runner’s high is, I urge you to listen to your body! You will know when something is not right. When your body is sending you signals to take it easy, don’t ignore them. For example, what started out as three to six weeks off may quickly escalate into a year’s worth of recovery time if you push yourself past your limits. No matter what, always stay positive! Remember that you will bounce back from an injury, just like you always have in the past. As long as you have the desire and drive to run, an injury will never hold you back for too long.